About "Assess the reasonableness of answers"
Even when we understand how to solve a problem, we might make a careless solving error. We should always check our answer to make sure that it is reasonable. Jon is hanging a picture. He wants to center it horizontally on the wall. 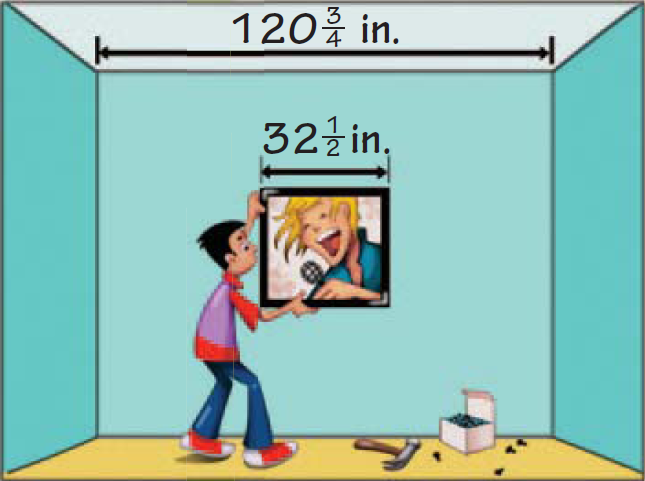 The picture is 32 1/2 inches long, and the wall is 120 3/4 inches long. How far from each edge of the wall should he place the picture ? Find the total length of the wall not covered by the picture. Find the length of the wall on each side of the picture. Jon should place the picture 44 1/8 inches from each edge of the wall. Check the answer for reasonableness. The wall is about 120 inches long. The picture is about 30 inches long. The length of wall space left for both sides of the picture is about 120 - 30 = 90 inches. The length left for each side is about (1/2) x (90) = 45 inches. The answer is reasonable because it is close to the estimate. Alana uses 1 1/4 cups of flour for each batch of blueberry muffins she makes. She has a 5-pound bag of flour that cost $4.49 and contains seventy-six 1/4 -cup servings. How many batches can Alana make if she uses all the flour? How much does the flour for one batch cost? • Each batch uses 1 1/4 cups of flour. • Seventy-six 1/4 -cup servings of flour cost $4.49. Use logical reasoning to solve the problem. Find the number of cups of flour that Alana has. Use that information to find the number of batches she can make. Use that information to find the cost of flour for each batch. Alana cannot make 0.2 batch. The recipe calls for one egg, and she cannot divide one egg into tenths. So, she can make 15 batches. A bag contains about 80 quarter cups, or about 20 cups. Each batch uses about 1 cup of flour, so there is enough flour for about 20 batches. A bag costs about $5.00, so the flour for each batch costs about $5.00 ÷ 20 = $0.25. The answers are close to the estimates, so the answers are reasonable. After having gone through the stuff given above, we hope that the students would have understood "Assess the reasonableness of answers".